The United States Intelligence Community (I.C.) is a federation of 17 separate intelligence agencies, military intelligence, and civilian intelligence and analysis offices within federal executive departments. The I.C. is headed by the Director of National Intelligence (DNI), who reports to the President of the United States. Among their varied responsibilities, the members of the Community collect and produce foreign and domestic intelligence, contribute to military planning, and perform espionage. The I.C. was established by Executive Order 12333, signed on December 4, 1981, by U.S. President Ronald Reagan. ^ "Executive Order 12333". Cia.gov. Retrieved 2013-01-23. ^ Dana Priest and William M Arkin (19 July). "A hidden world, growing beyond control". The Washington Post. ^ Priest, Dana (2011). Top Secret America: The Rise of the New American Security State. Little, Brown and Company. p. 320. ^ Michael Warner; Kenneth McDonald. "US Intelligence Community Reform Studies Since 1947". CIA. p. 4. Retrieved 28 June 2013. ^ Rosenbach, Eric, and Aki J. Peritz (12 June 2009). "Confrontation or Collaboration? Congress and the Intelligence Community" (PDF). Belfer Center for Science and International Affairs, Harvard Kennedy School. Retrieved 21 July 2009. ^ "Intelligence Community of the United States Government". ^ "DNI Releases Budget Figure for 2013 National Intelligence Program". Office of the Director of National Intelligence. 30 October 2013. Retrieved 2 August. ^ DNI Releases FY 2012 Appropriated Budget Figure. Dni.gov (2012-10-30). Retrieved on 2013-08-16. ^ "DNI Releases Budget Figure for 2010 National Intelligence Program". Office of the Director of National Intelligence. 2010-10-28. Retrieved 15 June. ^ "DNI Releases Budget Figure for 2009 National Intelligence Program" (PDF). Retrieved 15 June. ^ "DNI Releases Budget Figure for 2008 National Intelligence Program" (PDF). Retrieved 15 June. ^ "DNI Releases Budget Figure for 2007 National Intelligence Program" (PDF). Retrieved 15 June. ^ Hacket, John F. (2010-10-28). "FY2006 National Intelligence Program Budget, 10-28-10". Office of the Director of National Intelligence. Retrieved 15 June. ^ Matt DeLong (29 August 2013). "'"Inside the 2013 U.S. intelligence 'black budget. The Washington Post. Retrieved 31 August 2013. ^ Matthews, Dylan (29 August 2013). "America’s secret intelligence budget, in 11 (nay, 13) charts". The Washington Post. Retrieved 31 August 2013. ^ DeLong, Matt (29 August 2013). "2013 U.S. intelligence budget: Additional resources". The Washington Post. Retrieved 31 August 2013. ^ a b Barton Gellman and Greg Miller (29 August 2013). "U.S. spy network’s successes, failures and objectives detailed in ‘black budget’ summary". The Washington Post. Retrieved 31 August 2013. On August 29, 2013 the Washington Post published the summary of the Office of the Director of National Intelligence's multivolume FY 2013 Congressional Budget Justification, the U.S. intelligence community's top-secret "black budget." The IC's FY 2013 budget details, how the 17 spy agencies use the money and how it performs against the goals set by the president and Congress. Experts said that access to such details about U.S. spy programs is without precedent. Steven Aftergood, Federation of American Scientists, which provides analyses of national security issues stated that “It was a titanic struggle just to get the top-line budget number disclosed, and that has only been done consistently since 2007,...but a real grasp of the structure and operations of the intelligence bureaucracy has been totally beyond public reach. This kind of material, even on a historical basis, has simply not been available.” Access to budget details will enable an informed public debate on intelligence spending for the first time said the co-chair of the 9/11 Commission Lee H. Hamilton. He added that Americans should not be excluded from the budget process because the intelligence community has a profound impact on the life of ordinary Americans. In a statement on the release of new declassified figures, DNI Mike McConnell said there would be no additional disclosures of classified budget information beyond the overall spending figure because "such disclosures could harm national security". How the money is divided among the 17 intelligence agencies and what it is spent on is classified. It includes salaries for about 100,000 people, multibillion dollar satellite programs, aircraft, weapons, electronic sensors, intelligence analysis, spies, computers, and software. About 70 percent of the intelligence budget went to contractors for the procurement of technology and services (including analysis), according to the May 2007 chart from the ODNI. Intelligence spending has increased by a third over ten years ago, in inflation-adjusted dollars, according to the Center for Strategic and Budgetary Assessments.. The U.S. intelligence budget (excluding the Military Intelligence Program) in fiscal year 2013 was appropriated as $52.7 billion, and reduced by the amount sequestered to $49.0 billion. In fiscal year 2012 it peaked at $53.9 billion, according to a disclosure required under a recent law implementing recommendations of the 9/11 Commission. The 2012 figure was up from $53.1 billion in 2010, $49.8 billion in 2009, $47.5 billion in 2008, $43.5 billion in 2007, and $40.9 billion in 2006. However, the DNI has no authority to direct and control any element of the IC except his own staff — the Office of the DNI — neither does the DNI have the authority to hire or fire personnel in the IC except those on his own staff. The member elements in the executive branch are directed and controlled by their respective department heads, all cabinet-level officials reporting to the President. By law, only the Director of the Central Intelligence Agency reports to the DNI. Though the IC characterizes itself as a federation of its member elements, its overall structure is better characterized as a confederation due to its lack of a well-defined, unified leadership and governance structure. Prior to 2004, the Director of Central Intelligence (DCI) was the head of the IC, in addition to being the director of the CIA. A major criticism of this arrangement was that the DCI had little or no actual authority over the budgetary authorities of the other IC agencies and therefore had limited influence over their operations. The overall organization of the IC is primarily governed by the Intelligence Reform and Terrorism Prevention Act (IRTPA) amendments to the 1947 National Security Act. 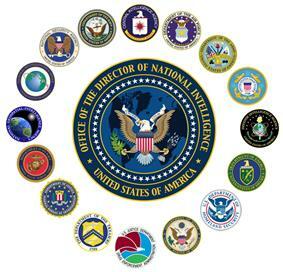 The National Intelligence Program (NIP), formerly known as the National Foreign Intelligence Program as defined by the National Security Act of 1947 (as amended), "refers to all programs, projects, and activities of the intelligence community, as well as any other programs of the intelligence community designated jointly by the Director of National Intelligence (DNI) and the head of a United States department or agency or by the President. Such term does not include programs, projects, or activities of the military departments to acquire intelligence solely for the planning and conduct of tactical military operations by United States Armed Forces". Under the law, the DNI is responsible for directing and overseeing the NIP, though the ability to do so is limited (see the Organization structure and leadership section). The Military Intelligence Program (MIP) refers to the programs, projects, or activities of the military departments to acquire intelligence solely for the planning and conduct of tactical military operations by United States Armed Forces. The MIP is directed and controlled by the Under Secretary of Defense for Intelligence. In 2005 the Department of Defense combined the Joint Military Intelligence Program and the Tactical Intelligence and Related Activities program to form the MIP. 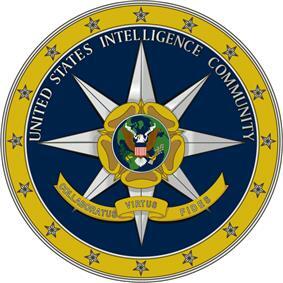 The official seals of U.S. Intelligence Community members. Collection, analysis, and production of sensitive information to support national security leaders, including policymakers, military commanders, and Members of Congress. Safeguarding these processes and this information through counterintelligence activities. Execution of covert operations approved by the President. The IC strives to provide valuable insight on important issues by gathering raw intelligence, analyzing that data in context, and producing timely and relevant products for customers at all levels of national security—from the war-fighter on the ground to the President in Washington. The term "Intelligence Community" was first used during Lt. Gen. Walter Bedell Smith's tenure as Director of Central Intelligence (1950-1953).